Following a car crash, a young woman awakens in a strange bunker. 10 Cloverfield Lane is far too well made to be ruined by its title, but it's a shame viewers are denied the chance to experience the film as a completely blind watch and enjoy it as the expertly constructed adult genre thriller it is. Back in 2008, with YouTube still barely out of its short pants, a trailer became what we now call 'a viral sensation'. The ambiguous promo - featuring a mysterious attack on New York, complete with the Statue of Liberty's head being tossed down a Manhattan street - eventually turned out to be for a found footage hybrid of Godzilla and Miracle Mile named Cloverfield. You would think in today's tuned in, spoiler obsessed world it would be impossible to pull off such a stunt again, but barely over a month ago a trailer emerged out of nowhere for a movie curiously titled 10 Cloverfield Lane. This led to much speculation, and many questions. Is it a sequel to Matt Reeves' monster movie? A 'sidequel' set in the same time-frame? Perhaps a prequel? Or maybe it's simply a cynical marketing ploy to get bums on seats for a movie that might otherwise end up straight to VOD without the connection. In the first minute of 10 Cloverfield Lane, we're given a significant clue as to whether the events of the film are set to run at the same time as Cloverfield; pay close attention to a certain prop, because figuring this out will likely increase your enjoyment of the movie. That opening scene, playing out in economic silence, introduces us to Michelle (Mary Elizabeth Winstead) as she packs up and leaves the apartment she shares with her boyfriend. Driving late at night, she's involved in a car crash that knocks her out cold. When she wakes, she finds herself chained in a strange room, which we learn is part of a bunker owned by seemingly paranoid survivalist Howard (John Goodman) and shared by the affable Emmet (John Gallagher Jr). Howard claims a major attack has been inflicted on the US, rendering the air outside toxic and fatal. Is his story true, or merely a ruse to keep Michelle captive? A highly accomplished and impressive debut from director Dan Trachtenberg, 10 Cloverfield Lane resembles the sort of movies M Night Shyamalan gave us back in his early heyday; it's filled with twists and turns but doesn't merely rely on such fleeting thrills, building a tense and paranoid atmosphere throughout. The script - written by Josh Campbell and Matt Stuecken and originally titled 'The Cellar' before a polish by Whiplash's Damien Chazelle - is a classic piece of American storytelling, tightly wound and constructed in flawless fashion; Rod Serling and Richard Matheson would be proud. Winstead and Goodman are at the top of their game here; it's a joy to watch their characters dance around each other in suspicion. 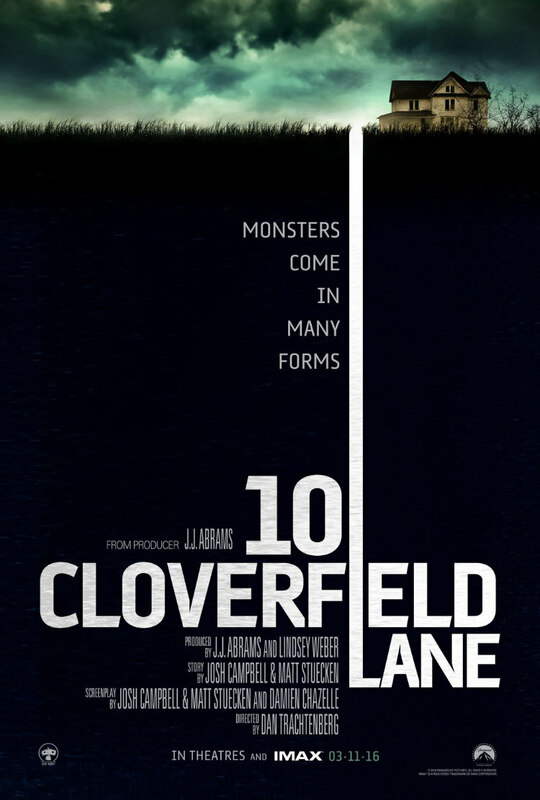 The sad truth however is that while a lot more people will see 10 Cloverfield Lane because of its title, they'd enjoy it incrementally more had it been allowed to stand under its original moniker. Thanks to the addition of 'Cloverfield' to the title, I spent much of the movie mildly distracted by my search for clues as to whether or not the movie actually relates to the 2008 film. In hindsight I wish I had been made privy to the exact nature of this relation before viewing, as it would have allowed for a more immersive experience. Changing the title gives us certain expectations, which negatively impact a late plot twist, one which should be on the level of Planet of the Apes and Psycho in terms of its "I did not see that coming!" shock factor. 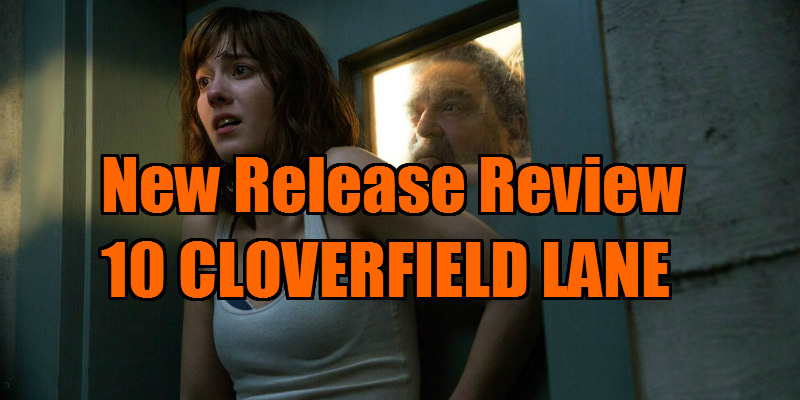 10 Cloverfield Lane is far too well made to be ruined by its title, but it's a shame viewers are denied the chance to experience the film as a completely blind watch and enjoy it as the expertly constructed adult genre thriller it is. It's a decision that will no doubt make producer JJ Abrams a whole lot of extra cash, but for its impact on the immersiveness of Trachtenberg's movie he deserves to spend some time locked inside his mystery box.